A longtime Historic Homeowner member recently welcomed fellow members inside her eighteenth-century house, which is being restored to the highest standards by noted preservation carpenter Robert Adam. Ten members toured the house, located in Harvard, Massachusetts, on December 5. They took an in-depth look at its evolution, which incorporates two timber frames, one dated to 1717, which were married together in the third quarter of the eighteenth-century. At the Harvard property, Adam is carefully analyzing centuries-old construction evidence and using it to reinstate original materials that were stored or relocated in the house. Pop-up tours like this give Historic Homeowner members the chance to view properties not typically open to the public. 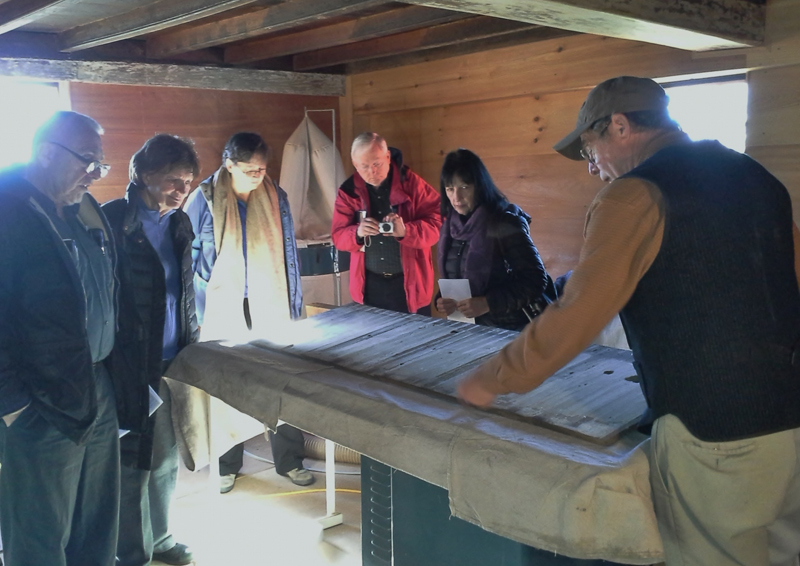 Members see firsthand how old houses evolve, and learn about historic fabric and construction practices in a hands-on way. Become a Historic Homeowner member. Learn more about reading the material evidence of old houses in Preservation Hot Topics.